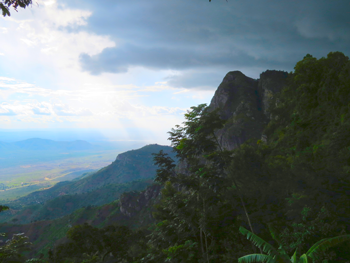 The Usambara’s are one of Tanzanian’s highlights. The mountains are home to an exceptional assortment of plants and animals and represent one of the highest degrees of biodiversity on the continent. The Usambara Mountains are ideal for hiking and biking because of its magnificent landscape, breathtaking view points and vivid hill sides. 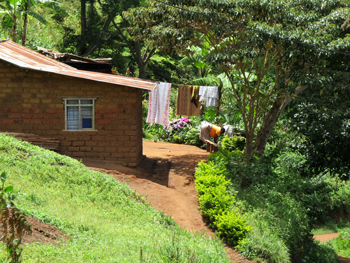 There are many places to visit in the Usambaras and they are all breathlessly beautiful – a tough choice. A few days in the Usambaras before your Zanzibar visit will be so dense of experiences and emotions it will feel as you have been gone for weeks. We choose Irente Farm Lodge because of its stunning location and view, the amazing homemade food, cheese, yogurt from the farm, and the friendly staff that love to welcome you. Just staying at Irente Farm is enough for the 3 days but close by you have various view points, trekking paths, rain forest and more offering striking nature and explorations. Our guide meet up in Dar Es Salaam and together you will take the bus from Dar es Salaam to Lushoto. It is an 8 hour drive in reasonably comfortable buses and you will see and experience a lot on the way. Flying to Tanga is an option, then it is 3 hours from Tanga to Lushoto. Arrival to Lushoto and Irente Farm Lodge in the afternoon. Today we get to enjoy the striking scenery around Irente Farm and just breath and relax. In the evening three courses home cooked dinner in the farm house, maybe in front of the fire, made of raw material from the farm and surrounding areas. Irente Farm Lodge is overlooking the valley below. Huge birds in the trees, stunning scenery and cozy atmosphere. 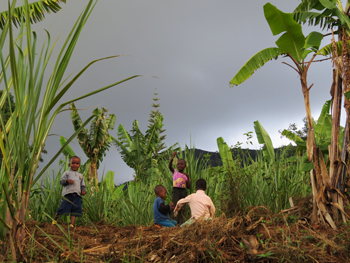 In the morning we take a tour up the mountain (2 km) and discover the life of the Wasambara tribe living on the mountain slopes. We walk on twisting paths passing picturesque villages in settings so beautiful you just want to inhale it. When reaching the 1400 m high point we will have the wide plain below us, mountains around us with villages in surreal locations which you suddenly find yourself in a few hours later. We go back to Irente Farm Lodge to enjoy a lunch under the trees where big birds have their homes and we overlook the valley below. After lunch we walk (6 km return) to another viewpoint 1750 m above sea level, to end the day with a sunset over the Usambara plain and mountains. We will talk to the people and find something to drink in one of the small bars that surprisingly enough exists. In the evening we sit together for another well prepared meal in the farm house. Magamba rainforest is reached from Irente Farm Lodge passing pretty areas and villages on the way. 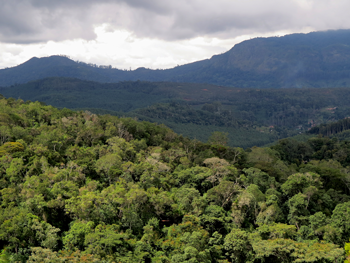 Once inside the dense rainforest ( 15 km return) we enjoy this special place and observe the life in the canopy. The forest is home for a big population of White and Black Colobus monkeys. At the view point, 1850 m, overlooking the whole area of Irente, we can observe the various weathers passing. Here we eat our lunch pack from Irente Farm Lodge with homemade cheese and other specialities. After a full day we will be back at the farm in the afternoon to enjoy the peace and surroundings. Dinner at the farm house with locally produced raw material. After breakfast on the terrace overlooking the valley and birdlife we head back to Tanga to catch the afternoon flight to Zanzibar. The stretch Tanga – Zanzibar is direct and takes about 20 min. Clothing: Hiking boots or hiking shoes. Sunhat if needed. Rain clothes in bag. 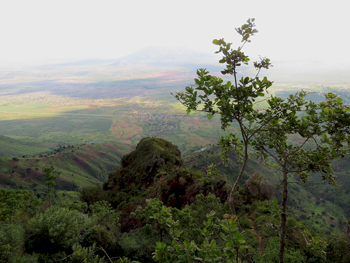 The Usambara Mountains are ideal for hiking and biking because of its magnificent landscape, breathtaking view points and vivid hill sides. They are considered being one of the world’s biodiversity hotspots with several endemic species and some areas are still covered by dense tropical forests and protected zones . 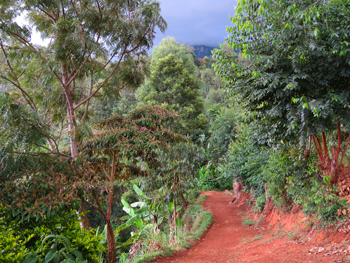 The highest peak is at 8,000 ft (2,440 m) and on the fertile slopes and on the plain below, farmers cultivate. 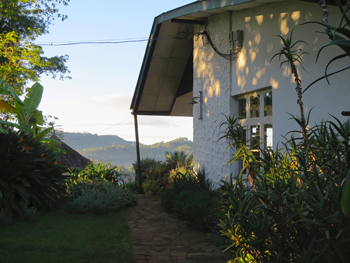 Usambaras´ viewpoints invite to spectacular views of the plains and in the evening the sky turns pastel toned and even Kilimanjaro can be spotted.